With his re-election looming, Nixon attacked this mild type of inflation and unemployment, he announced the "Nixon Shock" in an August 15, 1971, speech. Worthwhile goals, but the solutions were devastating. First, Nixon ordered a 90-day "...freeze on all prices and wages throughout the United States.” He created a Pay Board and Price Commission to control increases until well after the 1972 election. Third, Nixon imposed a 10 percent import tax to reduce the balance of payments. It only lasted four months. It forced America's trade partners to raise the price of gold to $38 per ounce. It was only three dollars higher, but it also sent the value of the dollar down. That made imported goods more expensive and created more inflation. It also destroyed the trust needed for global trade. Our allies began printing more of their own currency and raising interest rates to boost their value. Nixon's actions were popular at home, propelling him to victory in 1972. It was the largest Republican landslide of the Cold War. He won every state but Massachusetts. He went on to achieve his most notable foreign policy accomplishments. He went to Beijing, signed the Strategic Arms Limitation Treaty, and ended the Vietnam War. But he also sowed the seeds of stagflation. On July 25, 1969, Nixon stated that the United States would now expect its allies to take care of their own defense, but would provide aid as requested. The doctrine's purpose was to respond to anti-war protests and get the United States out of direct combat in Vietnam. Instead, the United States would train and arm local forces. Read the speech here. The Nixon Doctrine had a more long-lasting economic impact. It provided an entry into involvement in the Middle East. It outsourced protection of the oil supply in the region to the Shah of Iran and Saudi Arabia. Between 1969 and1979, the United States sent $26 billion in arms to the two countries to defend against communism. The arrangement continued until Russia invaded Afghanistan in 1978 and the Shah was overthrown in 1979. The Doctrine laid the groundwork for the War in Afghanistan and the Iraq War. They added $1.5 trillion to the U.S. debt. Nixon only added $121 billion to the $354 billion national debt during his term in office. It wasn't a record, compared to the debt of other presidents. But his Doctrine made his long-term impact on the debt much more significant. The special prosecutor for Watergate sought audio tapes of conversations recorded by Nixon in the Oval Office. Nixon refused, claiming "executive privilege" made him immune. 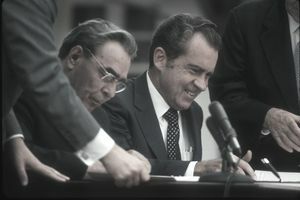 In the United States v. Nixon, the Supreme Court found that Nixon did not have the right, in this case, to withhold information to preserve confidential communications. This wasn't a diplomatic affair nor did it secure the national interest. Watergate eroded public confidence in government, as the country felt betrayed. In 1964, polls showed that 75 percent of Americans believed elected officials in Washington could be trusted to do what was right for the country. By 1974, only a third believed so. This lack of faith in government led to Ronald Reagan's election in 1980. It created public belief in trickle-down economics, which in turn led to increasing economic inequality.